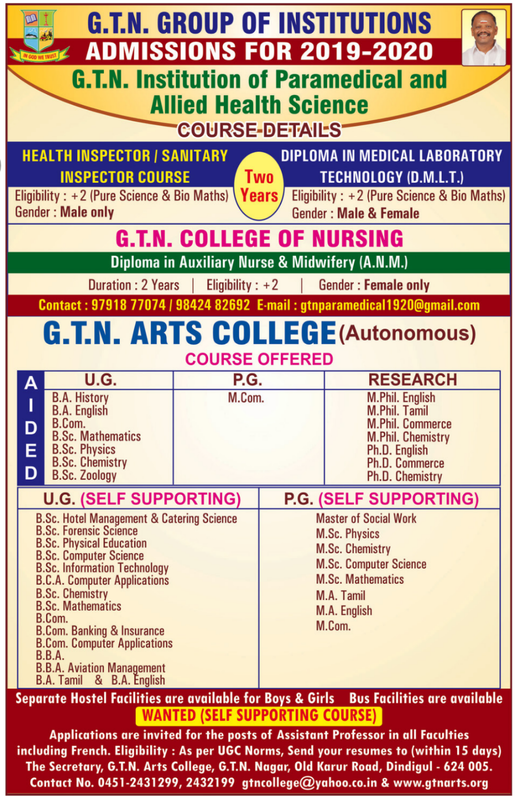 G.T.N Arts College, Dindigul has advertised in DINAMALAR newspaper for recruitment of Assistant Professors jobs vacancies. Interested and eligible job aspirants are requested to apply within 15 days from 07th April 2019. Check out further more details below. College Profile: G.T. Narayanaswamy Naidu Charities Trust was formed in August 1963. The late G.T. Narayanaswamy Naidu's name is one to conjure with. As a stalwart industrial magnate, he radiated sweetness and light. His heart beat in tune with all noble causes. To do good was his religion. Endowed as he was with an unclouded vision and an unerring instinct, he rightly realized that in educational advancement alone lies the greatness of a nation. He was therefore anxious to start schools and colleges, so that Free India might have a perennial supply of scholars, administrators, industrialists and statesmen.